Reply was designed for teams to work together, to respond to social conversations within one simple inbox. To invite your team members, click on Settings on the left hand side of your dashboard and then select the Team tab. From there, enter your team members' email addresses and click Send Invites. 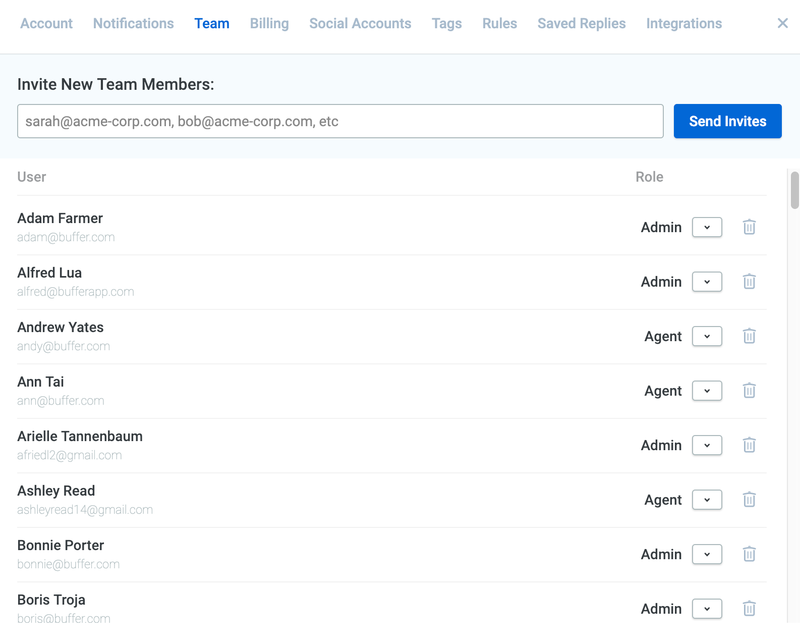 By default, team members will be assigned the Agent role, but they can be changed to the Admin role if needed, by clicking on the drop down arrow to the right of their current role, and selecting Admin. Keen to see how Reply works for teams? Join a webinar here! It’s really important that each team member pops over to their Account settings when starting out with Reply, so they can add their name and profile image. These are really handy for other team members so they can see who’s online, who’s already viewing a conversation, who sent the latest replies, and who left a note. Being passed around from agent to agent is a source of frustration for many customers. Wherever possible, try to keep conversations assigned to one person, so they can build trust and rapport with the customer. Learn how to auto-assign conversations to yourself here. 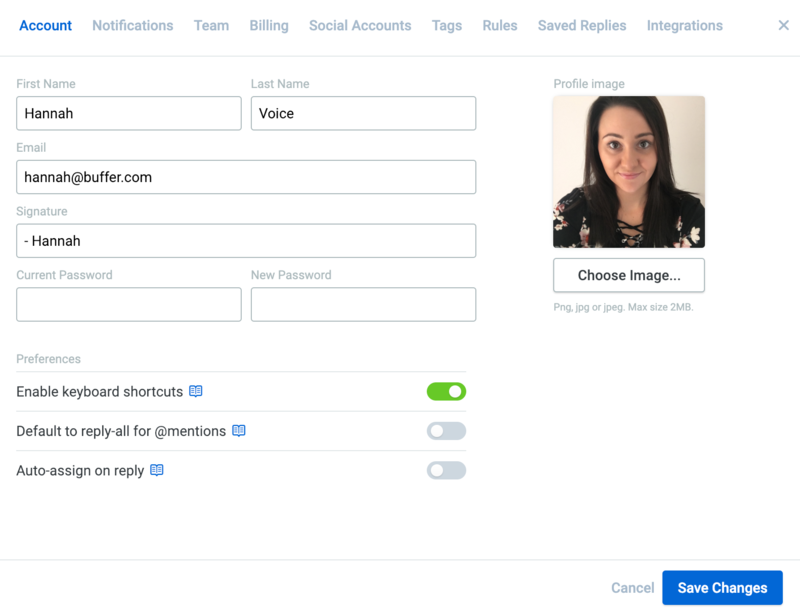 As well as being able to manually assign conversations to yourself (or another team member), you can also set up Automation Rules to have this happen automatically based on certain criteria, for example keywords or language. Tags are a really flexible option that allow you to organize and keep track of your social conversations. They can be used for prioritization, organization, follow ups, reporting, and so much more! Make sure your whole team knows which tags to use for which situations. It’s a good idea to think about your workflow, depending on team size and how much each person is spending online. Will everyone work out of the Team Inbox, or would you prefer to set up some dedicated folders? Should people work from oldest to newest, or newest to oldest? Do you have guidelines for teammates with regard to hopping into other people’s conversations in the Assigned folder? Do you have an escalation process in place? Saved Replies are pre-crafted responses that you create around your frequently asked questions. Using Saved Replies can reduce response times by saving your team from typing out the same answers over and over again. Typical examples might include your pricing information, refund policy, and answers to complex questions. While some of your team members might spend near full days in Reply, it could be the case that other team members only pop in now-and-then. For these team members, it’s helpful to make sure they have the right notifications enabled so they’re alerted if a follower responds to a conversation that’s assigned to them. The Team Report, which is available on our Business Plan, is where you'll find insights on team member activity. This report helps to answer questions like who sent the most replies last week, how many internal notes are being added, and how many conversations a team lead assigned. It's also a great tool to see, week over week, if your team is sending more or fewer replies, and which types of replies are sent most. This report can be a great indicator of whether you have the correct number of resources assigned to managing your support and engagement on social media and also potential gaps in knowledge. For example, if a particular team member is sending fewer replies than usual, or assigning a larger number of conversations to other team members, this could indicate that they need some extra help.